Bay Area Intactivists has been banned from participating in the 4th of July at Berkeley Marina celebration. For nearly a decade, Bay Area Intactivists has staffed an information booth at the 4th of July at Berkeley Marina celebration as part of our ongoing community outreach. We have peacefully educated thousands of visitors to our booth at this annual event. Many of the community members who we meet are grateful to learn of the proper care for genitally intact children or to discuss the damage caused by forced genital cutting. Others who are already well-versed on these subjects seek us out to voice their appreciation for our efforts to uphold the human right to genital integrity. Although we occasionally meet people who disagree that all children deserve equal protection from forced genital cutting, we strive to maintain civility in the face of adversity. Click here for a video featuring highlights from our 2013 4th of July at Berkeley Marina booth. I received your application for the 4th of July at the Berkeley Marina. Regretfully, I am going to decline. I have had numerous complaints over the past couple of years about the inappropriateness of your booth at our family-friendly celebration. It is just too upsetting for the crowds of children who come to the event. Thank you for understanding. Good luck with your endeavors. We are both dismayed and disappointed that the event organizers have chosen to ban Bay Area Intactivists in order to placate those who are uncomfortable with our message. We will hold a peaceful protest in response to this attempt at censorship. 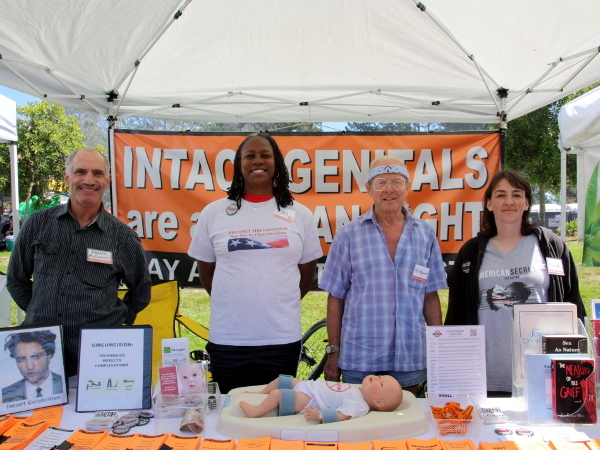 Take a stand with us July 4th at the Berkeley Marina to demand freedom from genital mutilation for everyone—male, female, and intersex!